here's a toughie, gang. i always really want to love all vegan places. but so many just make it so hard. example ... i used to love urban vegan. but then when i was pregnant, i ordered delivery & they forgot my order. twice. on two separate occasions. you don't eff with a pregnant lady who wants curry. anyway, the lincoln park location of urban vegan rebranded as vegan plate. okay, i don't know if it was a rebrand or new owners or what ... but the menu is literally exactly the same. so i'm saying rebrand in an attempt to regain some customers (like me) who gave up on urban vegan. ok, so the new vegan plate ... "our thai restaurant is known for its modern interpretation of classic dishes & its insistence on only using high quality fresh ingredients." good start. 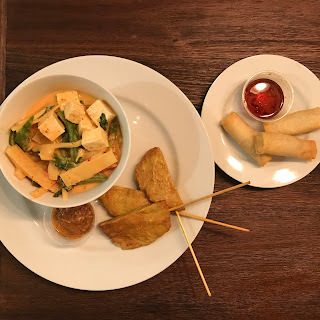 spring rolls ... "chicken" satay ... red curry with tofu. ok, all legit & delicious. loved the curry & have been craving it ever since. here's why i've been craving it & haven't been able to satisfy ... THEY. FORGOT. MY. DELIVERY. ORDER. AGAIN. i'm using caps lock for emphasis just like they did once i finally called & helped them remember ... see below. ok, so as much as i loved the food from vegan plate, i just haven't been able to bring myself to give them another shot. maybe one of you brave souls could test it out & let me know.